Simple words from me. A good tuto is not about nice and sweet. Its about simplicity and understanding. Think about it! How to hide your Music box ? 2.After that, please copy the code below the music that you like. 3. Then, DELETE your code like i did with the code that i've colored with pink color below. 4. Now, copy the code left. 5.Login to your blogspoot, and go to Design. Click Page elements and choose tthe HTML/Java Script. 6.You may paste the code and save! How to remove Subscribe to 'post atom'? 1. Follow the instruction below. 2. Then, press ctrl + f. Search this code <!-- feed links --> . 3.Once you've found the code, look below the <!-- feed links --> . 4.Now, you will find this code. How to create your own copyright on your blogspot? 4.Now, paste your code above </body> . ****Dont forget to edit the pink color that i've colored above. 5.Now, you may click save or preview. How to make a line (conclusion line) below your post? 1.First, login to your blogspot, and follow the instruction below. 2.Then, write your story or anything that you want on the entry. 4.Now, do you see the Edit HTML button(i've rounded above with pink color) beside Compose button above your new post box? Please click the button (Edit HTML button) without changing any of your words that you've wrote just now. 5. Then, Paste the code at the end of your post. 6.After that, click Compose button. 7.Now, the line is appear on your post. keep doing this if you like to have conclusion line. Good luck! There a various way in order to find image code or image URL. So, im gonna show you 3 steps. 2.Click images, and search the image that you want. 3.Now, choose the image that you like to and right click and choose COPY IMAGE URL. ***It is working when you're using google chrome. 2.Search any image that you want. 1.Login to your blogspot, and follow the instruction below. 2.Now, click the picture and upload the image that you want. 4. Once the picture appear, right click 'on' the image and choose Copy Image URL. How to creat scroll tool on your Blog Archieve? 2.Press ctrl + f on your keyboard, and search this code <div class='widget-content'>. 3.Then, you may copy this code. * you also can change the height that i've highlighted with green color above. 4.Replace this code <div class='widget-content'> with this new code . 5. Now, you may click save template or preview for better result. 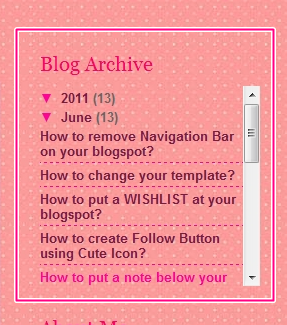 How to remove Navigation Bar on your blogspot? 2.Now, press cntrl+f on your keyboard and search this code /* Variable definitions . 4. Paste the code above this code /* Variable definitions. 5. You may click preview to see the changes. Now, click save.